ROMACKcrane sells Heavy Duty Open Winch Hoists provided by SWF & Street Cranes. This makes us possible to offer our customers a vast range of open winch hoists with special quality and performance. 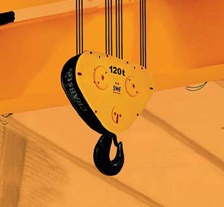 Our winch hoists are designed to operate in tough, arduous conditions with high frequency of switching operations. They are rated for higher duty classifications and/or faster lifting speeds than competitor hoists and the open plan design make servicing and maintenance uniquely easy. True vertical lift is standard, ensuring unprecedented precision throughout the hoisting operation. Open winch hoists are constructed in multiple combinations of drum length, gear ratio and reeving to provide mechanical handling solutions up to 160t safe working load.